Properties in Blairstown average 4.7 out of 5 stars. Property 4: Escape to Rustic Waterfront Luxury! 'The Round House' w/ Fire Pit, Deck & Billiards! Property 10: 'The Round House' w/ Fire Pit, Deck & Billiards! Modern Rustic Mountain House! Pool Table, 5 TVs, WiFi, TiVo,NetFlix/Hulu A/C! Property 11: Modern Rustic Mountain House! Pool Table, 5 TVs, WiFi, TiVo,NetFlix/Hulu A/C! Picturesque Hillside Cabin In The Woods On 1.5 Acres--wrap Around Deck--Hot Tub! Stayed here 3 times. 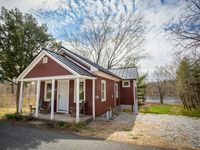 Love the location on the river and proximity to hiking the Water Gap. The River House has a lovely design and features on both the inside and out. Very comfortable. Looking forward to our next stay! Beautiful log cabin on the creek! 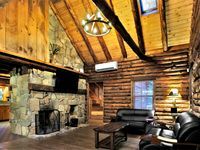 We loved staying in this authentic log cabin! It&rsquo;s secluded area by the creek but in a safe gated community. All the luxuries but with a rustic woodsy feel! We would definitely stay again!